Now Mrs. Whitsell was told that she too could do these things “through those promises that were so new yet so old, as given by Him. 'Not of myself do I do these things,' saith He, 'but God, the Father that worketh in me; for I COME from Him, I go to Him. '” Then, in this her first reading, Betty was told that she had been “a daughter of the Inn Keeper, that stood by - and was the second of those that took the Babe into their arms.” This information led Mrs. Whitsell to ask for the details of her experience as the Inn Keeper's daughter at Christ's birth in reading 1152-3, given by Cayce on November 27, 1936, at the home of David Kahn in Scarsdale, New York. Mrs. Whitsell was so taken by her reading that she referred to it henceforth as her Christmas reading. Now before her experience in the Holy Land, Betty was “in the Atlantean experience when there was the breaking up of the land itself, through the use of SPIRITUAL truths for the material gains of physical power. Yet the entity was among those that were of the children of the Law of One, in the name Aian. It was this earlier Atlantean experience that prepared Aian to receive information in another reading that she obtained five years after her Christmas meeting. This new information was about coming Earth changes. The changes described seem reminiscent of those that she had experienced when the last portion of Atlantis was destroyed. But more on that later. We continue now with Betty Whitsell's Christmas reading. Edgar Cayce now speaks from a sleep state. Yes, we have the information which has been given, also those records as made by the entity's experience and activity during that sojourn at the time of Jesus, the Master. In giving the interpretations of those records, well for the moment that there be the interpreting of how an entity's or soul's records are made or kept, and how they may be read. For the entity's study of same will arouse that attunement in the consciousness as to the reality of experience, of life, and the entity may come to know more and more that the expression of life in manifested form in the material world IS the expression of that influence or force called God. Upon the skein of time and space are the records made. For thoughts and deeds are indeed things, and their currents run with time and space and make their impressions there; just as in the mental forces it is gradually being comprehended that as the man, as the being thinketh in the heart, so is he. Thus as the entity dwells upon, as the entity turns within to meet its Maker and those promises that are living experiences, that may be read of self as to the manner in which ye abide in the life, the word, the being of Him ye have beheld manifested in flesh - as ye abide in Him and He in the Father - ye have then those influences in thine inner self that make for that as He gave, "There will be brought to thy remembrance ALL THINGS from the foundations of the world, that YE HAVE NEED OF in thine experience for the glorifying of the Father through the Son." In that sojourn we find the entity then was, in time, just a year younger than the little Mother who came to the Inn where the entity then was an aid to the parents. And the entity knowing of same through the meetings that were half forbidden by those in the Jewish law and questioned by those in authority for the penal law, there was caused not only the wonderments but - as seen from the nature of the natural development - a seeking to know. Also the entity FELT the emotions of some great thing in the experience of the world about to come to pass. The entity then, in the name Sarapha (or Sara),* requested that she might aid in the preparation of those quarters to which that Mother-to-be, that father, might come - that were revered by all. For it was well known to the Inn Keeper that which had been set by those high superiors or leaders, as to the care that must be given to those as they wended their way to fulfill the needs of an overlord demanding that all register for their contribution to an alien land. Yet as the entity waited, expectant, there was the general rabble; and there were the discussions of those that journeyed to Jerusalem for the meetings, as well as to the centers for their taxing-registration - as ye would term in the present. The entity was comely in person and was sought by one that would today be called a registrar, as companion; yet rejected him - though the entity has met him in this present experience; and the association has meant much, and much disturbance too. Then the entity aided, so that all was in readiness, when in the evening - just before the sun in all its glory of the Palestine hills gave forth almost into the voice of nature, proclaiming the heralding of a new hope, a new birth to the earth, and the glorifying of man's hope in God - the specter of His Star in the evening sky brought awe and wonder to all that beheld. And the entity, being anxious, gazed with wondering awe at that UNUSUAL experience to all, and wept with JOY of those unfoldments within self, of the emotions that made for the expectancy of glory surpassing what had been told of all the glories of her peoples in the days of old. There the entity felt what may be very close akin to the experiences in self in the present - that a new light, a new vision, a new experience was BEING BORN in every atom of its being. Then when it was known to the entity that the den, the cave, the stable had been occupied - Oh, the rush, Oh, the desire to be off to see what that experience might be, held the very being of the entity! And as soon as its duties were cleared about the home, as the space was very near, the entity started. But as the entity walked into the open upon that Eve, the brightness of His Star came nearer and nearer. And the entity heard, even as the Shepherds, "PEACE on earth, GOOD WILL to men." There came again that awe, that feeling of a new creation, of a new experience, as the entity among those - only with the closer attendant of the Mother - hastened; while all the rabble, all the jeers of a world were stopped! As it hastened to the quarters where the Mother lay, in all that awe of a new experience, and the light as from His Star filled the place, the entity then first beheld the BABE. That was the crowning experience, until the plea that she -too - might hold that glorious child in her arms also! Then as this became a reality, there were those feelings, those experiences - O that the world might know the beauty, the joy, the glory of the experiences of His Life in their own hearts and minds and beings! There the entity also saw the shepherds gather, there the entity also saw on the morrow the Wise Men - with their ladened beasts or camels, with all their praise for those who had kept the faith, in making and preserving, in keeping and helping those that were in need, that were alone - yet GOD with them! There were those experiences of the presence as well as that expressed in those strange tongues to the entity, though the entity knew and thought and felt and experienced the reverence and awe as shown by all. As the entity sought to find, to keep in touch with the mother, the Child, and then when the edict went forth, indeed was the entity's heart rent with fear. For that experience became then as something to be cherished, yet the fear of the law and the hatred that would naturally arise in the hearts of those that were persecuted. For oft was the entity's father questioned as to which way, as to what amounts, as to what WERE the activities of those men who had defied the authorities of Rome as well as of Herod the king at that experience. Those made for days and weeks and months when the entity wondered and wondered and wondered. And the necessity for menial labors by the great demands made upon those with whom the entity sojourned and those activities roundabout, brought mental and material distresses. Yet oft the entity in the stillness of the evening reviewed the happenings, and there was the seeking more and more as to what had become of His Star, His Light. And as there was followed the receding of His Star, and the flight into Egypt through the devious ways and manners in which there came the news through word of mouth, yet in awe and quiet kept, it made for that in the experience of the entity - when it sits alone in the twilight, and there is almost again felt the music of the spheres, the singing of the morning stars, as the earth is quieted - there enters oft again that peace, that is only troubled by the cares of a workaday world. In the days and months and years that followed, eventually the entity became closer to those in Bethany and those upon Mount Olive. For THERE the entity took up its abode, upon the edge of Olivet (? ), on the road that led to the great city. And there word was sought again of what had become of that glorious, that marvelous experience which to the entity became more and more a burning experience in the heart. Yet when persecutions came, and the influence more and more of the Romans, and more and more of the sects and activities of the Sadducees that persecuted especially those groups to which the entity had belonged, and in which it had found so much help, so much wonderment - then doubt and fears arose. For apparently, from the words that were heard, the Child had become only as another of those that were of the peoples, yet was it for ALL the peoples! For as other children came, and as other experiences were brought about, not until in those days when again as a child. He went with His parents and those of the great company to again register did the entity realize and know the truth of what had been experienced. For at the time or period when the Passover feast was demanded to be kept by all of the children of Israel, then the entity sought again that Child, that young man, that glorious child that questioned the doctors. And the entity kept close, that she - too - might hear. For it had put away then all thoughts of association or union with MEN; though beset and though disturbed, and though those forces of the periods were brought about. For the entity became what may be said to be as the first body to dedicate its mind, its body, its BEING to a Purpose, to a Child! Throughout those experiences, then, the entity wondered; and sought for word as to His progress, in following that which had become almost as a story; yet the entity held to those visions, those experiences in the evening before, during those periods when they beheld the light, when they beheld the Child in the Mother's arms - and that glorious moment when it had been placed in her own, and the entity had pressed its own lips to the brow of that Babe! When there began then the ministry of Jesus the man, the entity held fast - and stayed close to every word that might be gathered from those who heard the more oft. But when the visits brought Him near, and yet the cares kept the entity closer to the abode near the highways through which throngs now oft passed, the entity pondered, pondered -grew fearful for the things that were being said. And then the rejection by His own peoples, when He first began His ministry, brought tears of scalding shame to the entity for those very ones that seemed to doubt when they should know. When there came at last those days when there was the triumphal entry from Bethany into Jerusalem, to the temple, the entity was among that mighty throng that cried, "Hosanna to the Highest - the King cometh." And there the entity met those disappointments again, when that mighty force, that glorious creature, that mighty man among men was not proclaimed king. And He seemed to exert so little of that necessary material application of a glorious power and might over those things in man's experience of sickness, of doubt, of fear! For many of those were known to the entity who had been healed. And the entity was especially joined closer then to that one Bartaemus, [Bartimaeus?] who had rested oft by the way, close to where the entity abode. When the days of the Crucifixion were passed, and the entity stood then with the Holy Women and those that aided in sustaining those of the household that were beginning to feel that possibly the Mother, Mary, had misjudged. Yet the entity KNEW from her own experience, had not forgotten that choir before the celestial throne that sang, "Glory, GLORY in the highest - Peace - PEACE on earth, to all men of good will." Those experiences the entity held, and they are innate in the present; though the entity was first among those to suffer martyrdom by the roughness of the Romans that attempted to disperse the crowds. For through the injuries that came, broken of body, the entity suffered in the flesh; but then it was even as now - the entity looks ever to Him who IS life, light and immortality to those who put their trust wholly in Him! In the application then, we would give counsel to those and to the entity who have tasted, who have felt, who have known within themselves that He is the Way, He is the Truth, the Light, and no other name is given under heaven whereby man may be made whole, or whereby man may know his true relationships to God. Hold FAST to that, O Daughter of the Inn Keeper, O the Beholder of His Glory; O the joyous, gracious feelings that fill thy soul and being with the richness of the earth poured out at His feet, with those that experienced the lowly shepherds that came to see that glorious sight, and they -too - were not hindered from beholding the face of their Savior. And ye, too, O Daughter, may know His face - but turn WITHIN! For THERE ye may meet Him, as so oft ye did in those days, those weeks, those months, those years ye recounted in thine inner self those glorious experiences, those glorious happenings of that day when the Babe, the child Jesus lay in thy arms. For He is very nigh unto all that call on His holy name. He has promised and His promises are sure, to you - to YOU - to Y O U; and IN you may you know! Not listening to those fears, but listening to those things even as ye heard during those days when those wonderments were so close a portion of thine experience. Embrace him NOW, even as ye did upon that glorious day when the earth saw and heard and felt her King, her Maker, had taken on the earth and become a part of same. So may ye, too, take on God - in Him, and become a part of HIS dealings with man! (Q) What did I do as the Inn Keeper's daughter? (A) As indicated throughout, the care in the home - and yet those many activities as indicated. And with the persecutions, and at last the death of the father, the entity then prepared or kept an inn herself, upon the Mount of Olives nigh unto Bethany, on the road from Jerusalem to Gizeh. (Q) What in my previous appearances merited my being born as the Inn Keeper's daughter? A) As has been indicated in those appearances before, there was brought about that seeking, that desire to be SO CLOSE, and to be willing to dedicate self. O that man would but gain that willingness in self to be a channel to be used, even as He gave, "Not my will but Thine, O God, be done in and through me." That has been the cry and is the experience of all, even as that entity then, that may come to know His face! (Q) What experience did I have with the Three Wise Men? (A) As has been indicated. (Q) How did I contact them? (A) As has been given. The entity was there at the time when they came as from the King, and saw - as given - not only the glories and the gold and the precious things of the earth poured at His feet, but saw also the adoration as from the lowly shepherds that were bewildered by those in power or in authority, and yet - as the entity - saw indeed that there was no respecter of persons in the face or heart of that Babe! And indeed He is today no respecter of persons! For Jesus, the Christ, as God, is the same yesterday, today and forever! 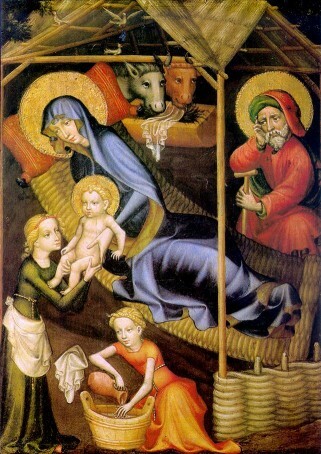 (Q) How long did the holy family remain in Bethlehem? (A) Until the time of purification was passed. Twenty-nine days, as ye would count suns today. (Q) How long was I closely associated with them? (A) Throughout the period, and in those ways and manners as has been indicated. (Q) Was I associated at that time with the entity who was my husband in this life? (A) As has been given, he was the registrar - rejected by the entity. (Q) How was I associated with Ruth , the sister of Jesus? (A) As has been indicated, there were some periods or changes in between - there were some doubts and some fears, some not understandings as to why the other members of the family could not see in the Child, in the Man, that which had been experienced by the entity. Only when the days of the Crucifixion, the Resurrection were passed, and there was the greater knowledge that indeed - as many of the Romans gave - "INDEED this was the Son of God," did the entity become very closely associated with Ruth - and that only for very short periods. For, as indicated, she was among those of a different class or group, and of those peoples that had joined with those that to the entity were to be hated for their part in her own father's death and the persecutions and questions that had been brought in the experience. (Q) Why is it, having had such an experience, that I have not become purified and more as I should like to be? (A) If - IF ye will but empty thyself, ye may be FILLED with that glory even as then! Count not judgments as the judgments of man. For man looketh on the outward appearance, but God seeth - even as ye have experienced in those moments of thy closeness - the heart, and that purpose, that WILL, that desire there! (Q) Would it be well for me to give my Christmas Reading in Virginia Beach this year, and Norfolk? (A) In ANY place, where there may be an audience had, give it! For, from this day forth, this will have a new meaning - not only to thee but to thy hearers. In His name, then, may the blessings of the Father, in the Christ, be upon thee and thy efforts to point the Way to the Child, Jesus, who in His humbleness, who in His glory, made Himself as man - that men might know the love of God to the sons of men that seek to know His ways. Amen. Mrs. Whitsell had several readings for physical problems between her Christmas reading (1152-3) and this one (1152-11), which deals in part with predictions for coming Earth changes. Along the way she often asked the sleeping Cayce for guidance as to what she should be doing in life. This recurrent theme is again dealt with by Cayce's source in the words below, which also cover only a portion of the reading. Note that the first paragraph deals with the principles to be embraced in the new order of peace that was to be established at the end of WWII. And note also that the second paragraph correctly predicts the time of that establishment as 1944 and 1945. For, with those changes that will be wrought, Americanism -the ism - with the universal thought that is expressed and manifested in the brotherhood of man into group thought, as expressed by the Masonic Order, will be the eventual rule in the settlement of affairs in the world. When these things are considered, then, it is self-evident that individuals should be up and doing. Especially the entity, with its abilities, has definite work to do in the present. The entity has the ability to work with or through individual groups, - not as a propagandist, but - as has been so oft indicated - do not magnify the differences of various groups, but rather UNIFY the sameness as expressed in many of them that hold to the principles as given in Him. All of these should be taken into consideration by this entity; and its abilities as a speaker, its abilities as a writer should be directed in those conditions and affairs that will more and more unite seekers in every phase of life, in every position, in every portion of the country, to that standard set by Him. Not as in a church, not as in an ism or cult, but in that every soul does the best he can where he is - and all with one ideal: "I am my brother's keeper - Christ the Lord is my brother!" Then, with the knowledge of these, - first the principles, then the material changes. (A) As indicated, these choices should be made rather in self. Virginia Beach or the area is much safer as a definite place. But the work of the entity should embrace most all of the areas from the east to the west coast, in its persuading - not as a preacher, nor as one bringing a message of doom, but as a loving warning to all groups, clubs, woman's clubs, writer's clubs, art groups, those of every form of club, that there needs be - in their activities -definite work towards the knowledge of the power of the Son of God's activity in the affairs of men. How True Are The Earth-Change Predictions In Reading 1152-11? We find the ring of truth in Mrs. Whitsell's readings presented above. For if Atlantis actually existed, and if in her experience there Mrs. Whitsell was one of those of the Law of One, and if she was so very involved with sending the faithful to safety lands before the final destruction of Atlantis, is it not believable that in her life 65 years ago she would have been provided with information concerning coming Earth changes in her readings? And as for her experience as the Inn Keeper's daughter in Palestine, would not her soul's exemplary record on Atlantis have prepared her to be present at the birth of Jesus? Consider also the accuracy of the pre-WWII prediction that a new order of peace was to be established in1944 and 1945, a prediction which actually came true. As one who was ten years old in August of 1941, I can tell you that no one in my family had any idea our nation would be thrust into WWII in a few short months. And as a teenager in 1943, my entire neighborhood in Chicago thought that WWII was going to last at least another five to ten years. Thus, the improbable prediction from Cayce's source came true when WWII ended in 1945. But what of the Earth-change predictions that follow just after reading 1152-11's successful prediction of war's end in1944 and 1945? Since these historically unprecedented Earth change predictions have not yet occurred, are they wrong in some way? Are they too improbable to come true? Has humanity's need for Earth changes been altered? Or will the changes start any day now? These are among the questions we have been pondering for many years. They will be addressed in a comprehensive article being readied for January, 2002. It's possible that this article may mark the end of our efforts here at Hutton Commentaries.